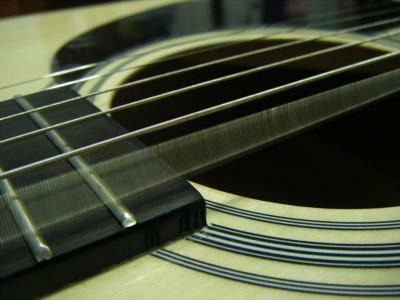 Sound is actually a pressure wave. When an object vibrates, it creates a mechanical disturbance in the medium in which it is directly adjacent to. Usually, the medium is air. The medium then carries the disturbance in the form of oscillating and propagating pressure waves. Longitudinal Waves - particles vibrate in the same direction as the wave moves. Transverse waves - particles vibrate at right angles to direction of motion. Sound waves must have a medium such as air to carry them. 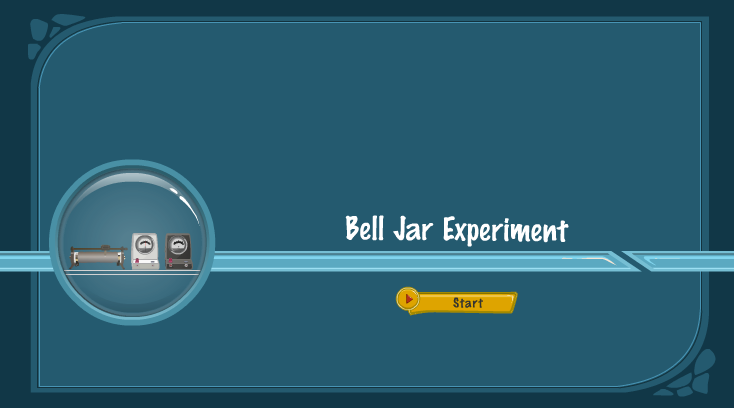 Here a buzzer is hooked up in a bell jar. As the air is pumped out the sound of the buzzer grows fainter and finally dies away. You have to be able to mark off at least a hundred meters and have a clear view of the person standing at the other end of the field for this to work. Ideally if you can get 150 to 300 meters apart, you will get much better results. The limiting factor in this experiment is how quickly the timers can respond to seeing the lid hit the can and hearing the noise. The closer together you are the less time you have to respond. 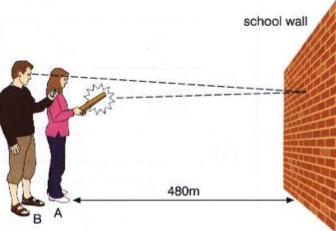 At 150 meters, there is almost a half second lag between seeing and hearing. This is enough to get a good reading if your timers are accurate. Use a trundle wheel to measure the distance between timers and banger. If you don't have a trundle wheel, then you can use a long measuring tape or you can measure your step and count out the steps to measure the distance. The more accurate your distance measurement is, the more accurate your estimate of the speed of sound will be. Use three timers, not just one. That way if one person is a bit slow and another is a bit fast, the average time will be more accurate. They have to watch the noise maker and start the watch when they see the lid hit the can or the cymbals come together. Then they have to hit the stop button when they hear the noise. The person who is banging the pot, the can or the cymbals has to stand so the timers get a clear view of the moment that the noise is made. Get several good readings and then average the results. Now make the calculation: distance divided by time gives speed. The speed of sound is approximately 330 meters per second but there is some variation due to weather conditions. Did your measurement come close? a The experimenter stands as far away as possible from a large reflecting wall and claps their hands rapidly at a regular rate. b This rate is adjusted until each clap just coincides with the return of an echo of its predecessor, or until clap and echo are heard as equally spaced. 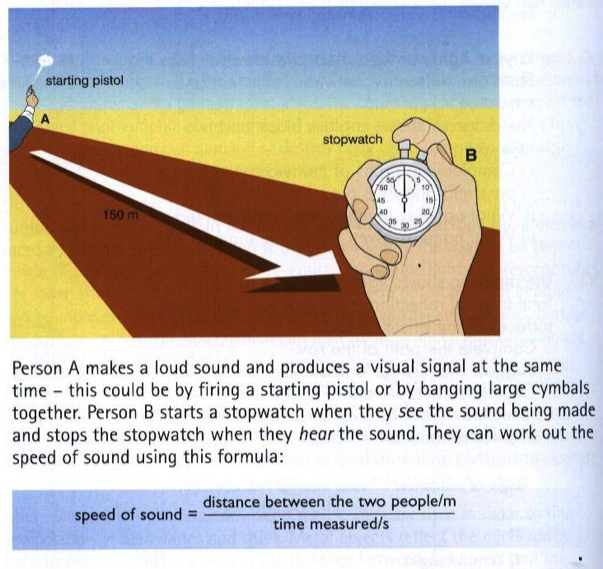 c Use a stopwatch to find the time between claps, t. Make a rough measurement of distance to the wall, s. Thus the speed of sound, v = 2s/t in the first case.